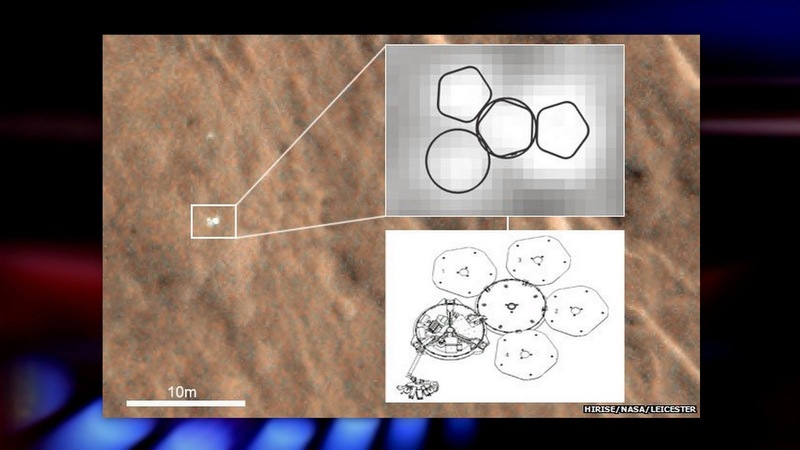 The missing Mars robot Beagle 2 has been found on the surface of Mars and is apparently intact. The discovery was made with the aid of new high-resolution images taken from orbit which have identified its landing location. The UK-led probe had tried to make a soft touchdown on the surface of Mars on Christmas Day 2003, using parachutes and airbags. However, contact was lost with the probe and it was assumed it had either burned up in the atmosphere or been destroyed in a high-velocity impact. There were even some fanciful theories that Martian's had destroyed the probe [Anandtech forum]. The new pictures, acquired by NASA's Mars Reconnaissance Orbiter, appear to contradict all such theories however. Nonetheless, Professor Mark Sims, Beagle's mission manager from Leicester University said the real cause was still open to speculation. "The failure cause is pure speculation, but it could have been, and probably was, down to sheer bad luck - a heavy bounce perhaps distorting the structure as clearances on solar panel deployment weren't big; or a punctured and slowly leaking airbag not separating sufficiently from the lander, causing a hang-up in deployment," he told BBC News. The discovery of Beagle 2 comes less than a year after the death of the probe's principal investigator, Colin Pillinger and just days after The Royal Society scientific institution announced an award in commemoration of the Professor.